People who keep inordinate sums in taxable and tax-deferred investments are guaranteeing themselves perpetual future taxes on their RMDs and Social Security. This will be a big deal if those distributions occur after 2025 when U.S. income tax rates are bound to be double or higher versus what they are today. 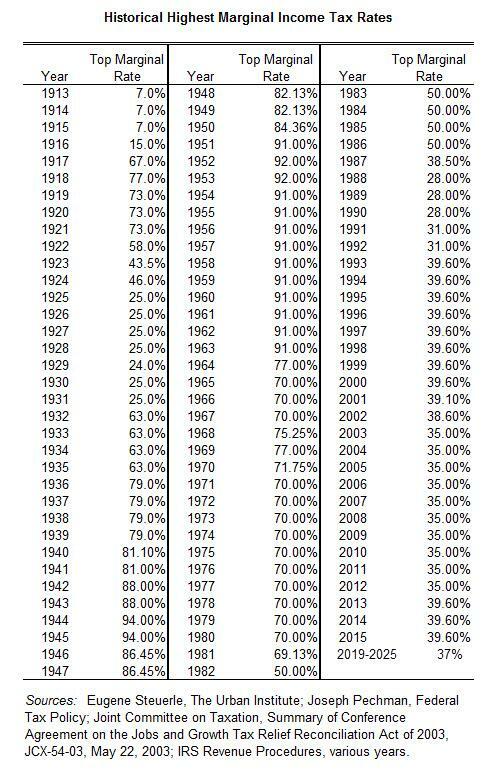 Naysayers who don’t believe tax rates could ever double should study history. For the investor, taxes represent a real threat to wealth and a cost that must absolutely be controlled. And the only way to do this is to take deliberate steps not just to defer taxes, but to permanently eliminate them. Remember: A tax ignorant approach toward your investments will inevitably lead to ignorant results. Thus, to avoid that fate, you must take a proactive approach. Minimizing taxes, or what investment professionals refer to as “tax-efficient investing” is often presented with an emphasis on deferring taxes today while ignoring what future tax rates are likely to be. Moreover, many professionals mistakenly operate under the false assumption that most people will be in a lower tax bracket during retirement. Given the fiscal challenges facing the U.S. government and given that today’s income tax rate are already at historical lows, the truth is that much higher taxes await U.S. citizens after the 2025 expiration of the current rules under the TCJA of 2017. Let’s examine tax-efficient investing by layers. Using strategies like tax-loss harvesting to dump your losing investments and to offset any gains you may have with losses. This strategy is reserved for your taxable investment accounts. Making sure investment gains you realize in your taxable investment account qualify for the lower long-term capital gains rate by holding your investments for a minimum of 12-months or longer before selling. Putting tax-inefficient assets like commodities (NYSEArca:DBC) and REITs (NYSEArca:REET) inside your IRA, Roth IRA, 401(k), or other retirement plans. Making sure your retirement distributions from your tax-deferred bucket (traditional IRA, simple IRA, SEP IRA, 401k, 403b, and 457) are at or below your standard deduction by the time you reach your RMD age of 70 1/2. The 2018 standard deduction for single filers is $12,000, for heads of household $18,000, and for married couples $24,000. What does it mean? If your RMDs are at or below these numbers for your applicable tax payer filing status, it means your retirement distributions are essentially income tax-free. Making sure your Social Security income isn’t taxed. Keep in mind that even so-called “tax-efficient” investments like municipal bonds and oil and gas partnerships will lift your provisional income, which is the amount of money the I.R.S. keeps track of to determine how much of your Social Security gets taxed. The retirement goal should be to stay underneath these provisional income thresholds to ensure your Social Security comes back to you tax-free. The provisional income threshold for single tax filers is $25,000 whereas it’s $32,000 for married couples. Layer 1 tax-planning is more straight forward compared to Layer 2. It’s also important to mention that Layer 2 is where many financial advisors and individual investors miss when it comes to minimizing taxes. People with inordinate sums tucked away inside their taxable and tax-deferred investments that keep doing what they’re doing are guaranteeing themselves perpetual future taxes on their RMDs and Social Security. While it might not seem like a big deal today, it will be a big deal if those distributions are scheduled to occur after 2025 when U.S. income tax rates are bound to be double or higher versus what they are today. Naysayers who don’t believe tax rates could ever double, should study history and fully understand that high tax rates have historical precedent. In other words, they’ve happened in the past and will happen again in the future. If U.S. income taxes are at historical lows today, the next logical step is to utilize strategies that capitalize on this fact. While it may seem counter-intuitive, the easiest way to do this is to start contributing money to Roth IRA, Roth 401k, and if you don’t qualify for either, then to execute Roth IRA conversions. Let’s discuss the latter. Roth IRA conversions are an especially powerful tool for investors that have retirement account balances so large inside their tax-deferred bucket that RMDs at age 70 1/2 will effortlessly exceed their standard deduction. Likewise, if there’s any guaranteed pension income that boosts provisional income thresholds, it may even make sense to fully empty or convert the entire tax-deferred bucket to a Roth IRA. Finally, Roth IRA conversions are an excellent tool for high income earners that are phased out of making regular contributions to Roth IRA. Using Roth conversions gets some or all of their retirement assets into the tax-free zone. True tax-efficient investing is more involved than taking the simplistic steps of minimizing taxes today by overstuffing your company 401k plan, for example. In reality, it involves taking proactive steps to minimize – and even completely eliminate – the threat of future taxes. This is not a cost-free exercise. While nobody enjoys paying taxes, the math of paying taxes today versus gambling to see what future rates are likely to be on your retirement distributions makes strategic sense. What does it involve? It means taking unconventional steps to deliberately pay taxes at today’s historically low rates for the benefit of shifting more money into tax-free assets like Roth IRA and Roth 401k. This, of course, can and should be done with the help of a carefully crafted, mathematically proven retirement plan. And if you’re unable to do it alone, your retirement planner or CPA should be enlisted. In the end, you don’t need to be a historian or mathematician to understand that future tax rates need to be higher to keep the U.S. government fiscally solvent. The former U.S. comptroller, David Walker, has written and spoken extensively about this fact. Other sane voices and fiscal conservatives agree. The underlying message is that investors should immediately heed the warning by implementing a multi-layered approach to reducing taxes.